You can easily replace the garbled, random sound in your home movies with music or narration or add sound to silent movies using this movie audio replacement tool. Supported Audio Types: MP3, WAV, AVI, MPG, MPEG and OGG. The application also includes an integrated sound recorder. Save your output as AVI in demo version or as AVI or MPEG in the professional version. 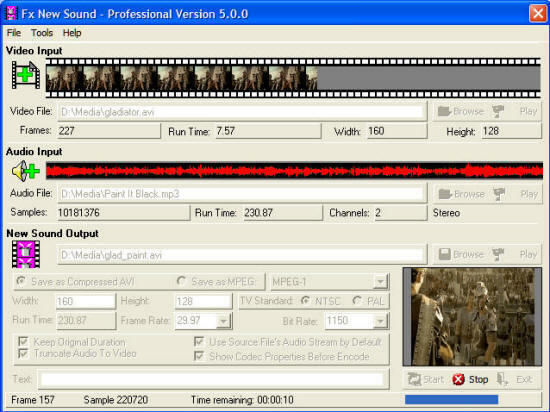 Replace the garbled, random sound in your home movies with music or narration using this movie audio replacement tool. Add sound to silent movies. You can even replace the sound in one movie with the sound from another movie. Supported movie input types avi, mpg, mpe, mpeg. Resize video output, change bit rate, frame rate, color depth and TV format standard. Add text to your video output. Supported audio type wav, mp3 mp2 ogg. Record audio with the included recorder. Join AVI and MPEG videos to still images with the included Video Joiner.